Bristol based Let Them Hang. 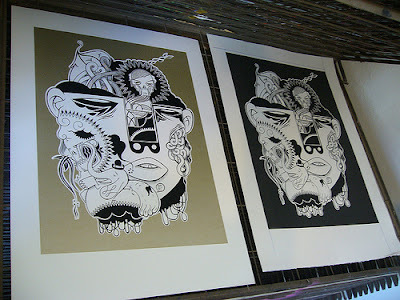 have just dropped some fresh new screenprints by Rich T. Rich T paints and draws in Bristol, he is 1/4 of the invincible "WHAT" crew, along with RPM, Sainty and Sums. The screenprint is available in two colourways, both of which have a layer of varnish overprinted to highlight the face against a matt background - hard to see in the picture, but they look nice and shiny! 500 x 700mm with two non-parallel deckled edges. Available now from Let Them Hang.